Last night, Daimler Trucks North America LLC debuted their long-awaited self-driving big rig. As part of their public spectacle, Daimler even showcased the autonomous truck by sending it off on a drive atop the Hoover Dam. Of course, this emerging technology wasn’t the only thing being celebrated Tuesday night. Daimler’s event also coincided with new Nevada legislation that allows Daimler’s truck– nicknamed “Inspiration”– to become the first ever fully licensed self-driving semi-truck on public roads. That’s right; starting immediately, businesses will now legally be able to use these trucks for business. “We are really showing that we’re at the cradle of innovation,” Nevada Gov. Brian Sandoval said during Tuesday’s unveiling. Unfortunately, though, Daimler has put a hold on customer purchases, instead opting for more time to refine the technology to ensure complete safety and performance. They say that this sort of patience is necessary because of the skepticism surrounding autonomous vehicles. Daimler Trucks North America president and CEO Martin Daum also pointed out that while people may be willing to forgive a slew of accidents caused by tired truck drivers, they wouldn’t be nearly so forgiving for just 1 accident caused by a self-driving truck. For that reason, Daum also said that the company has no intention of ditching drivers in the future. Yes, that means nobody’s losing their job. Instead, drivers will still be behind the wheel, watching over things as this new technology makes their life easier. Even better than that, though, is the fact that these trucks WILL MAKE the roads safer. How much safer? Well, in 2012, approximately 330,000 large trucks were involved in accidents on American highways, killing nearly 4000 people. Insane, right? Statistics like that have helped to motivate Daimler in their pursuit over the years. What do you think about Daimler’s new self-driving truck? Can they really make the roads safer?? Let us know in the comments below. 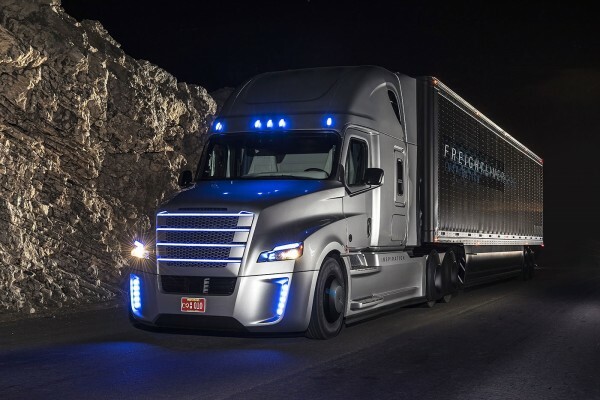 This entry was posted in Culture, Trucks & SUVs and tagged big rig, daimler, Daimler Trucks North America, Daimler Trucks North America president and CEO Martin Daum, emerging technology, self-driving truck, truck. Bookmark the permalink. Is Lamborghini About to Drop a New SUV??? Truck car accidents are mainly due to car drivers being careless. Phones,cigarettes, food and just a ME first attitude as well as just flat out ignorance are the leading cause for the fatalities in a car truck wreck. Do your research and you’ll discover the facts. Just watch a highway merge ramp or off ramp for 1 hour… these trucks will help but without a public educational program on the media outlets good folks will die over and over due to THEIR OWN ACTIONS. And the poor driver other cmv will live with that the rest of THEIR lives.